This post is part of the Donohoo Descendancy Project. Caroline (Green) Donohoo was the wife of Michael Donohoo, son of Patrick and Sarah (Thornbury) Donohoo. Caroline Green Donohoo left few records of her own, as with most women of her time. Her story has emerged from the documents of those in her life: her husband, children and even former slaves. She managed a large household of eleven children plus many slaves and helped her husband run a tavern hotel. By all accounts she was well beloved by those around her because of her generosity and kindness. Caroline Green was born in 1817 in Kentucky, likely in or near Bardstown, the daughter of Geo. Green. In October of 1836, nineteen-year-old Caroline married twenty-five-year-old Michael Donohoo [1, 2].The couple would welcome eleven children (five sons, six daughters) into their family over the next twenty-five years. Michael bought significant amounts of property throughout the 1840s and 1850s, including the Bardstown Hotel [3, 4], a well-reputed way station for travelers . Caroline, for her part, was noted as “extremely hard to beat for gentility and cleverness” as hostess by visitors to the tavern. Caroline’s father, Geo Green, lived at the hotel with the family during his elderly years . Caroline lost three of her daughters before they reached adulthood. On 22 August 1859, sixteen-year-old Emma succumbed to typhoid fever [8, 9]. Less than a year later, on 7 May 1860, thirteen-year-old Alice J. died of consumption [10, 11]. The next year, Caroline gave birth to her last child, the eleventh, another daughter they name Carrie [12, 13]. Carrie died a mere two years later on 8 December 1863. The girls are buried side by side in the St. Joseph Cemetery . How Caroline’s mother-heart must have ached to bury three daughters in the space of four short years! 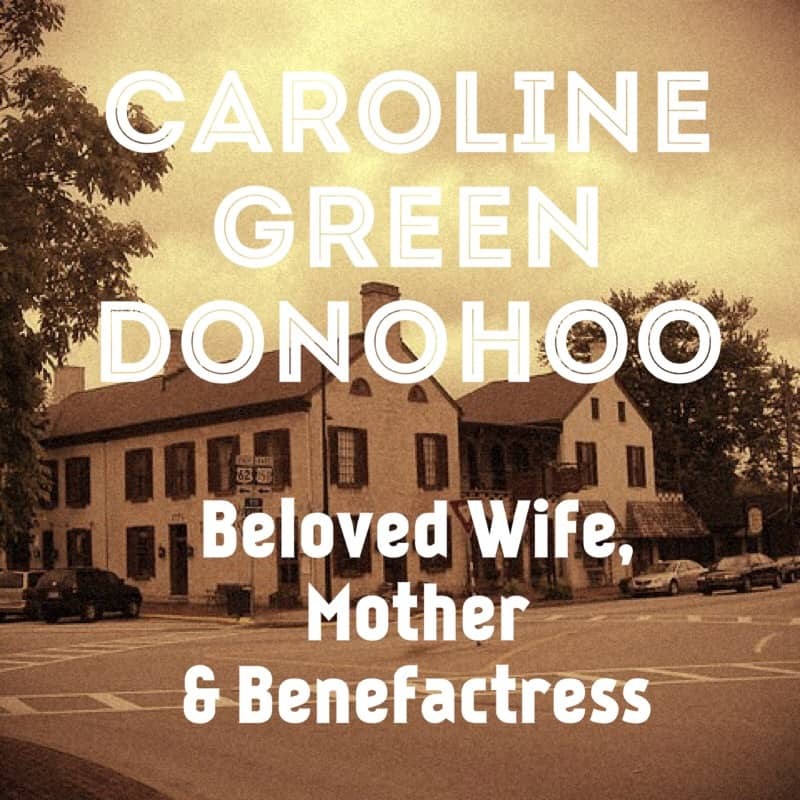 Even without records of her own to tell her story, it is clear that Caroline Green Donohoo was a woman of kindness, strength, and generosity; she was an anchor to her family. Newspaper interview: “Has Risen from Slave to Bishop.” Sunday, August 14, 1910. Evansville Courier and Press (Evansville, IN). Page 2. Accessed at GenealogyBank.com on 16 March 2015. “Kentucky, County Marriages, 1797-1954,” index and images, FamilySearch (https://familysearch.org/pal:/MM9.1.1/V65Q-G6L :accessed 18 December 2014), Michael Donohoo and Caroline Green, 07 Oct 1836; citing p. , Nelson, Kentucky, United States, Madison County Courthouse, Richmond; FHL microfilm 481,488. Nelson County, Kentucky deeds, 1785-1904; index, 1785-1947, 1785-1947. Kentucky. County Court ‎(Nelson County)‎. Salt Lake City, Utah : Filmed by the Genealogical Society of Utah, 1966. Microfilm of originals at Bardstown, Kentucky. Family History Library Film 0482724: Grantee index 1785-1893. Nelson County, Kentucky deeds, 1785-1904; index, 1785-1947, 1785-1947. Kentucky. County Court ‎(Nelson County)‎. Salt Lake City, Utah : Filmed by the Genealogical Society of Utah, 1966. Microfilm of originals at Bardstown, Kentucky. Family History Library Film 0482726: Grantor index 1785-1893. Historic Nelson County, its towns and people. Sarah Borders Smith. Bardstown, Kentucky : GBA/Delmar, 1983. vi, 488 p. : ill. Updated ed. of 2 works previously published as: Historic Bardstown, Nelson County, 1968: and Historic Nelson County, 1971. Family History Library 976.9495 H2. Page 92-94. “Our Trip.” The Lebanon post,August 23, 1854. Repository:University of Kentucky. Accessed at Kentucky Digital Library: http://kdl.kyvl.org on 23 December 2014. M. Donohoo, District 1, Nelson, Kentucky. Ancestry.com. 1860 U.S. Federal Census – Slave Schedules ‎[database on-line]‎. Provo, UT, USA: Ancestry.com Operations Inc, 2010. Original data: United States of America, Bureau of the Census. Eighth Census of the United States, 1860. Washington, D.C.: National Archives and Records Administration, 1860. M653, 1,438 rolls. Emma Donohoo. 1860 U.S. Federal Census Mortality Schedules, 1850-1885 ‎[database on-line]‎. Nelson County, Kentucky. Ancestry.com. Provo, UT, USA: Ancestry.com Operations, Inc., 2010. Emma Donohoo. Nelson County, Kentucky cemeteries. Schroeder, Margaret Johnson, Nelson County Genealogy Roundtable ‎(Bardstown, Kentucky)‎. Bardstown, Kentucky : Nelson County Genealogy Roundtable, c1985-. v. 1. Northeastern section — v. 2. South Western section including the Abbey of Gethsemani — v. 3. Northwestern section including Nazareth & St. Thomas — v. 4. Central section including Bardstown and St. Joseph cemeteries. Family History Library 976.9495 V3n. Page 8. Alice J. Donohoo. 1860 U.S. Federal Census Mortality Schedules, 1850-1885 ‎[database on-line]‎. Nelson County, Kentucky. Ancestry.com. Provo, UT, USA: Ancestry.com Operations, Inc., 2010. Alice J. Donohoo. Nelson County, Kentucky cemeteries. Schroeder, Margaret Johnson, Nelson County Genealogy Roundtable ‎(Bardstown, Kentucky)‎. Bardstown, Kentucky : Nelson County Genealogy Roundtable, c1985-. v. 1. Northeastern section — v. 2. South Western section including the Abbey of Gethsemani — v. 3. Northwestern section including Nazareth & St. Thomas — v. 4. Central section including Bardstown and St. Joseph cemeteries. Family History Library 976.9495 V3n. Page 8. Carry Donohoo, born 3 July 1861. Ancestry.com. Kentucky, Birth Records, 1847-1911 ‎[database on-line]‎. Provo, UT, USA: Ancestry.com Operations Inc, 2007. Original data: Kentucky. Kentucky Birth, Marriage and Death Records – Microfilm ‎(1852-1910)‎. Microfilm rolls #994027-994058. Kentucky Department for Libraries and Archives, Frankfort, Kentucky. Emma, Alice J., Carrie Donohoo. Nelson County, Kentucky cemeteries. Schroeder, Margaret Johnson, Nelson County Genealogy Roundtable ‎(Bardstown, Kentucky)‎. Bardstown, Kentucky : Nelson County Genealogy Roundtable, c1985-. v. 1. Northeastern section — v. 2. South Western section including the Abbey of Gethsemani — v. 3. Northwestern section including Nazareth & St. Thomas — v. 4. Central section including Bardstown and St. Joseph cemeteries. Family History Library 976.9495 V3n. Page 8. M. Donohoo, District 1, Nelson, Kentucky. Ancestry.com. 1850 U.S. Federal Census – Slave Schedules ‎[database on-line]‎. Provo, UT, USA: Ancestry.com Operations Inc, 2004. Original data: United States of America, Bureau of the Census. Seventh Census of the United States, 1850. Washington, D.C.: National Archives and Records Administration, 1850. M432, 1,009 rolls. Walters, Alexander. My Life and Work. New York: Fleming H. Revell Company, 1917. Page 23-24. Accessed at docsouth.unc.edu on 28 January 2016. “Has Risen from Slave to Bishop.” Sunday, August 14, 1910. Evansville Courier and Press (Evansville, IN). Page 2. Accessed at GenealogyBank.com on 16 March 2015. Nelson County, Kentucky, death records : 1852 thru 1857, 1859, 1861, 1874 thru 1878, 1904, 1907. by Frances Terry Ingmire. St. Louis, Missouri : F.T. Ingmire, c1983. Kentucky vital records. Series 3; v. 90. Family History Library 976.9495 V2ing United States & Canada Book. Page 96. Kentucky Probate Records, 1727-1990,” index and images, FamilySearch (https://familysearch.org/pal:/MM9.3.1/TH-1951-20799-20061-37?cc=1875188&wc=M6QD-J3D:173614801,174118601 : accessed 25 December 2014), Nelson > Will records, 1875-1878, Vol. 17 > image 182-183 of 357; county courthouses, Kentucky. Page 291.